If some confectioners were willing…To let the shape announce the filling, We'd encounter fewer assorted chocs…Bitten into and returned to the Box. Today, a large range of colorful, flavorful confections available in the market, which serve as a treat to our tongues as well as our eyes. May it be the candies, bite-size chocolates, cookies, lollies, or other sweets; not only children but grown-ups also favor them. Adults being health conscious, consume them with confessions. In Europe and US, syrups, caramel, cocoa powder, milk powder, and sugar are generally used. In Indian subcontinent, the confections are often generally referred to as Mithai, which is based on the main ingredient khoyaa; the thick hard cream of milk. Mithai is also made from Halwaa, the wheat extract or it can be made from gram flour. Confections in Indian subcontinents also use palm sugar or jiggery; the concentrate of cane juice as a sweetener. Confectionery is an art of making confections by using sugar and a carbohydrate based binding medium. Flour Confections − They are cakes, tarts, doughnuts, cookies, sweet pastries, or any similar confection made using flour. They are mainly served in desserts course. 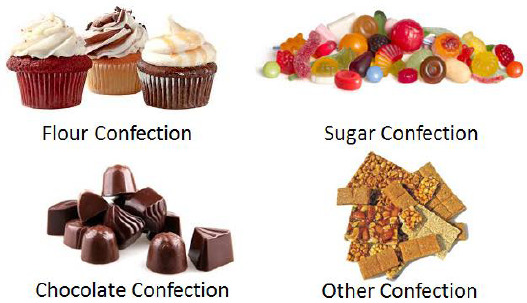 Sugar Confections − They are candies, chewing gums, and jellies. They flavor and color sugar as their main ingredient. They are made at high temperatures around 150oC. The spoilage is low and hence they have longer shelf life without refrigeration. Chocolate Confections − They use cocoa powder and chocolate syrup as their main ingredient. They need refrigeration during warm weather. Milk Confections − They are thick milk cream based/milk powder based confections made by combining various dry fruits, flavors, and colors into them. They are treated as a part of main course. They are best when fresh. Their shelf life is short but can be extended by refrigeration. Other Confections − They are made from extract of soaked wheat, which is flavored, thickened, and colored. Fruits/Dry Fruits/Nuts − They are a prominent ingredient. Fruits are cooked with or without sugar to get sweet thick pulp. Dry fruit pieces, Nut powders, broken Nuts, or roasted nuts are used. Sugar (Glucose/Sucrose) − It is required to bring sweetness to the confection. Cocoa Powder − It is a key ingredient of preparing chocolates and chocolate-based confections. Milk Powder − It brings thick and moist physique to the confection. Pectin − It is a texturizing gelling agent and thickener. It is used in preparing gums, chewable candies, and jelly products. Gelatin − It is used almost exclusively in confectionery products which require long, tough, gum-like textures. Acid − It is lemon juice, tartaric acid or any vinegar. Essence − It is a flavoring agent for the confections. Color − It is simple food color. It is available in dry as well as liquid form. These commodities often involve preparation, mixing, cooking, dispensing, and packaging machines. They are used depending upon the requirement. In smaller food preparation units, not all types of machines are required. They can use cake/candy/jelly molds, icing bags, trays, frying, and baking instruments. Caramel − Wet caramel is prepared by melting sugar with water then cooked with milk powder. Dry caramel is prepared by cooking sugar by itself until it liquefies and caramelizes. Chocolates − Bite-sized confectioneries generally made with chocolate. Dodol − A toffee-like confection prepared in South East Asian countries such Indonesia, Malaysia, and the Philippines. Fondant − It is a thick paste made of sugar and water. It is often flavored and colored, used in preparation of sweets, icing, and cake decoration. Fudge − It is made by boiling milk, milk powder, and sugar together. Halwaa − It is made of the extract of wheat soaked overnight, sieved and cooked with sugar and color till it becomes thick. It is often arranged in layers, and cut into cubes. Candy − It is hard and based purely on sugar. For example, lollipops, peppermint drops and disks, candy canes, and rock candy. Marshmallow − fluffy and puffy lightly flavored candies. Marzipan − An almond-based confection, doughy in consistency, a sweet yellow or white paste of ground almonds, sugar, and egg whites. It is used to coat cakes or to make confectionery. Mithai − A generic term for confectionery in India, it is typically made from dairy products, powdered nuts, cardamom powder, and saffron.